Secondhand smoke, pollution, chemicals, ash from fires. Most people breathe these things in and out every single day without much thought. After all, it’s all just air isn’t it? However, these small particles are collectively referred to as “nanomaterials” which are all 1 to 100 nanometers smallor, in layman’s terms, too small to see with the naked eye. 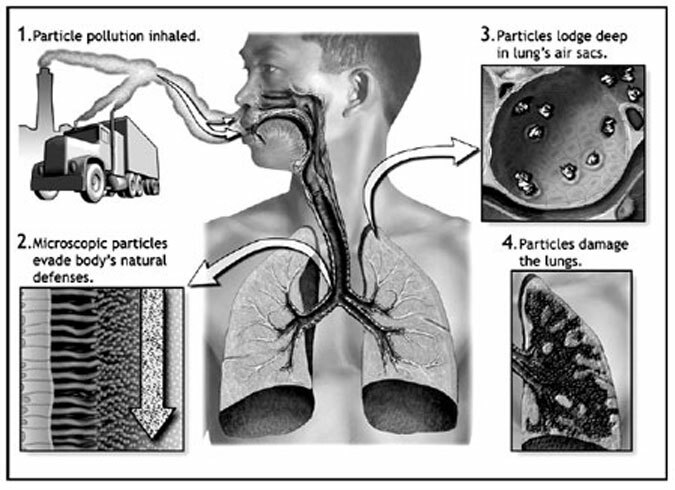 These nanomaterials are everywhere, both in nature and in industrialization so people can’t escape breathing them or filtering them out, and some of them might be doing harm to the bodies that breathe them in. Nano Toxicology focuses on the toxicity of these materials, as they are often deadlier than their larger counterparts. Basically, scientists who study nanotoxicology want to know how much of these nanomaterials humans and the environment can be exposed too before bad effects start to happen, as testing shows them to cause inflammation and even the ability to travel to the bloodstream and brain. As stated before, these nanomaterials are everywhere and cannot be escaped, and they can be eaten, drunk, absorbed through the skin, and inhaled by breathing. Many of them are harmless, and those that aren’t harmless, such as secondhand smoke and volcanic ash, normally don’t enter the body in large enough quantities to cause problems. Besides, most people would do their best to get away from volcanic ash and smoke, so they don’t breathe in too much. Nanomaterials can be metal based and carbon-based and can be of different sizes, which can affect how toxic they are and just what body parts they can get into, specifically regarding the lungs. Inhaling these nanoparticles is one of the most common ways of getting them into a system, and from the lungs, they can get into the bloodstream, and if workers are working around materials like asbestos, their lungs need protection to prevent side effects due to long-term exposure. Skin contact is also a concern, especially for carbon nanotubes, which can enter cells of intact skin or through wounds on the body, and then cause inflammation of those cells. Because they are impossible to avoid, the nanomaterials can enter the body, and then cause some problems based on their toxicity. Some predicted effects include inflammation and the weakening of the immune system, as well as their ability to cross through cells and tissues to affect the rest of the body. Cells can die based on their exposure and can even damage DNA and cause small mutations. However, since these nanomaterials and their toxicity levels change over time and based on so many factors, it can be difficult for scientists to track their exact properties and the effect those can have on the body. The important thing is to stay away from materials such as asbestos, mold, or other hazardous materials that can get in the air and into a body because those particles have been proven to be dangerous with high exposure.